April is the month to make an easy and delightful day trip from Seattle to the Skagit Valley, where the tulips are out in full force. Hundreds of acres quiver with color, providing endless photo opportunities. Note that the festival doesn’t happen in just one place; you can conduct your own driving tour of the fields or take an organized tour. There also are events at different venues scheduled throughout the month. Get all of the answers – including a bloom map, schedule of events, and more – at the official Tulip Festival website. 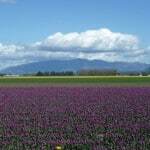 This entry was posted in A Short Drive Away, Seattle Tours and tagged Seattle day trip, Skagit Valley, tulip festival by admin. Bookmark the permalink.